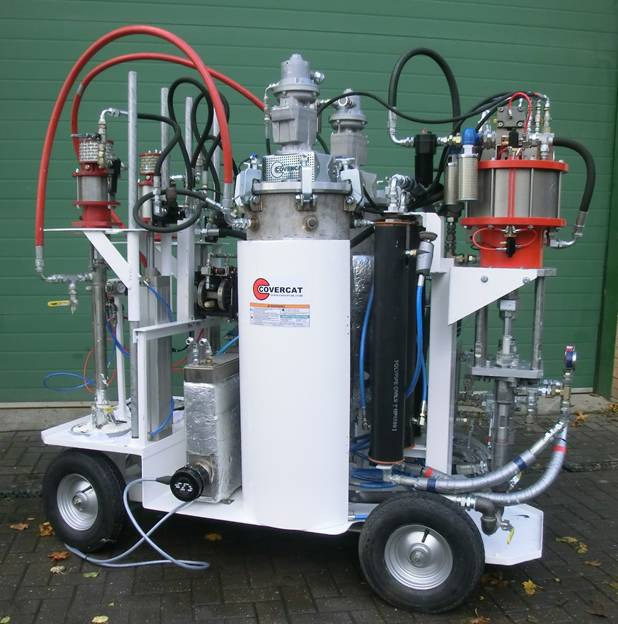 The CoverCat 302T is a robust site capable Spray machine for application of plural component materials by heated airless spray. The machine includes heated tanks, Fluid heaters and heated hoses for a complete system control of material temperature and condition. It may also be used as a batch dispense unit for premix repair applications. The system is compact, mobile and simple to use being most suited to small and medium sized applications and can replace Single Pack Application without adding solvent. This is intended as a solvent free application unit and may also be used with high solids material making solvent addition un-necessary. The CoverCat 302T is capable of high pressure delivery of 6.0 litres/min (1.1gpm) at 20 cycles/min. Hose lengths up to 30m (100ft) can be used.